A man working on his sailboat near the shoreline and nightfall was coming. Deciding to just stay with the boat, he threw out his anchor, and went to sleep. During the night, the boat started drifting because he had not set his anchor deep into the sea bed. The boat went miles into the open seas while the man slept peacefully in his boat. In the night he awoke to find the boat had gone into the high seas and was being rocked violently by the waves. He had lost his sense of direction. It was dark and stormy. Quickly, he grabbed his compass and reset his sails toward the shoreline. The waves continued to crash until he drew near to the shoreline, and with the sandy beach in sight he reset his anchor, this time casting it deep into the sea bed. 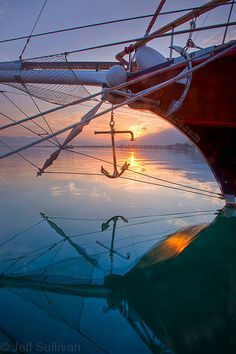 Until morning he continued to check his anchor to be sure it would not drift again. If you are a Christian, you’ve been the man in the boat at least once. We all go through phases where we grow tired and decide to sleep. We become tired of God’s word, lost our desire to study, been overwhelmed by the worlds demands on us, and we’ve slept. Matthew 13:15 describes it saying “For the hearts of this people have grown dull. Their ears are hard of hearing, and their eyes they have closed, lest they should see with their eyes and hear with their ears, lest they should understand with their hearts and turn, so that I should heal them.” We become tired, and lose our focus. We forget the anchor is there, fail to check it, and we drift. You don’t have to live a life of wild living to become the prodigal son. Just sleep a while, forget who you are in Christ, and you’ll drift far away. When the man on the boat awoke, he did two things. The prodigal son did those same things. First, they confessed their mistake. Realizing that he had drifted and no longer knew where he was, he grabbed the compass. He had made a mistake, and he realized it. The prodigal son realized that his Fathers servants lived a better life than the one he had found (Luke 15:17). Confessing to yourself that you’re not where you need to be with Christ is the first step back to the joy you once had. But if you just stop at confession, if you get stuck in step one, you’ll live a defeated life of “I wish I had”, “I wish I could”, and “If only I had not”. Keep going. Find your compass and reset your sails. The second step they took was one of repentance. Repentance is turning away from sin and back to God. Once the sailor realized how far he had drifted, he turned his boat for the shore. The prodigal returned to his father and fell into his open arms, where he was met with the grace of a loving father who restored to him what he had lost. The sailor reset his sails, returned home, and continued to test his anchor through the night. We all have to check our anchor from time to time. Are we studying God’s word? Are we praying? Are we fellowshipping with His people? If you are not strengthening your relationship with God, the life of this world is weakening it. Hebrews 6:9 tells us that Christ is the “hope we have as an anchor for the soul, both sure and steadfast”. Set your anchor deep. Deep into God’s word, deep into prayer, deep into conversations with His people. We all have a little bit of Esau in us. Esau gave up his birthright for the pleasure of a moment, for a simple bowl of soup. The Esau in us will turn us away from God, cause us to drift. In that drifting we take ourselves to a foreign land, a dark place, a place of destitute living. We slowly destroy the joy of our salvation until we finally have no peace and no hope. If you are there, if you are awakening to realize the storm around you and the darkness you’ve drifted into, you only have two steps to take back. Confession and repentance. Admit your mistake, and return. The Fathers arms are wide open to embrace you, to steady your boat.